Northern Cedar Mesa from Maverick Point, pre-sunset. Colorful sunsets have been almost nonexistent around here lately. My mantra “clouds make the sunset” was demonstrating itself again. Only this time by shutting off the sunset afterglow colors with a cloud bank on the far western horizon at sunset time. Maybe this evening would be different. Once again things looked promising: cumulus clouds and clear air thanks to another brief cold front that even gave us about a quarter inch of rain. 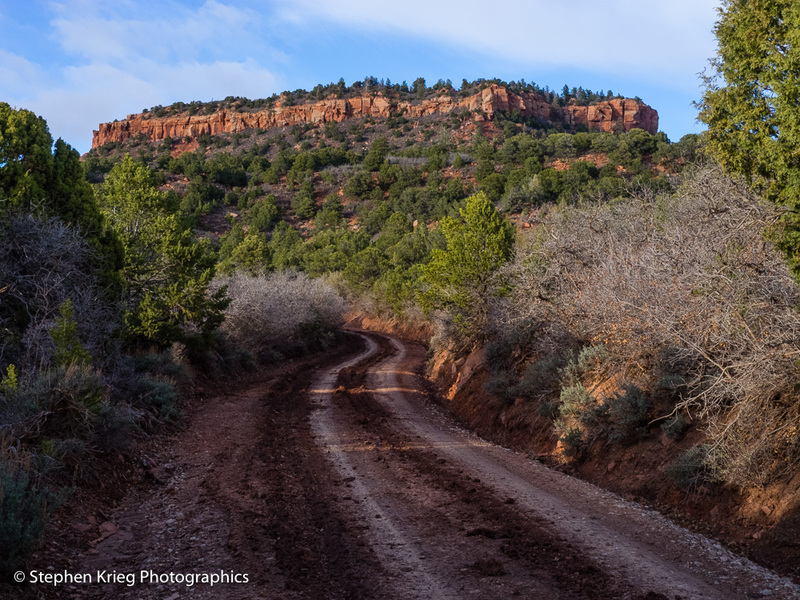 Bears Ears Road, above Maverick Point. So I headed up Maverick Point to see what would be. 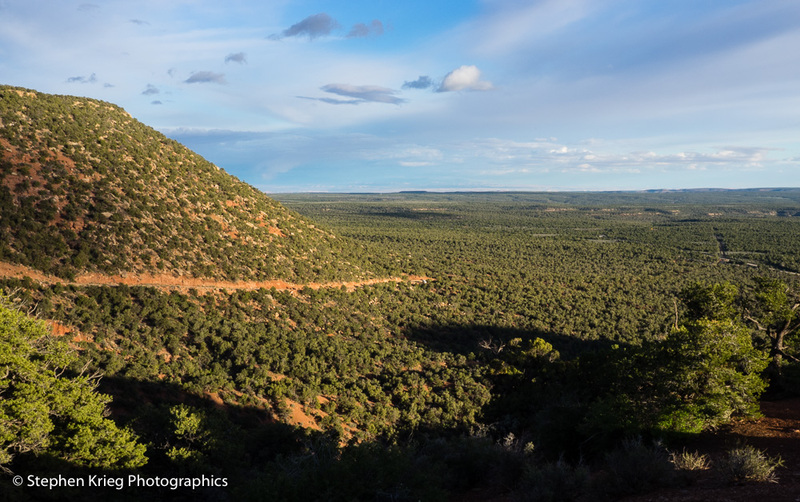 After checking out how quickly the Bears Ears road was drying out (it’s a slippery, even dangerous mess when wet), I then rolled back down to Photographer’s Point. No one was camping there at the time, so I claimed it for my own for the last hour until sunset. Instead of planting a flag I set up my camp chair and tripod. Appropriate. The highly eroded extension of Maverick Point, around which the entrance highway (Utah 275) to Natural Bridges National Monument winds, was right below. It’s a visual and photographic delight, being composed of red cliffs, dark green Pinyon pine/Utah Juniper high desert dwarf forest, and snaking away from foreground to middle ground. 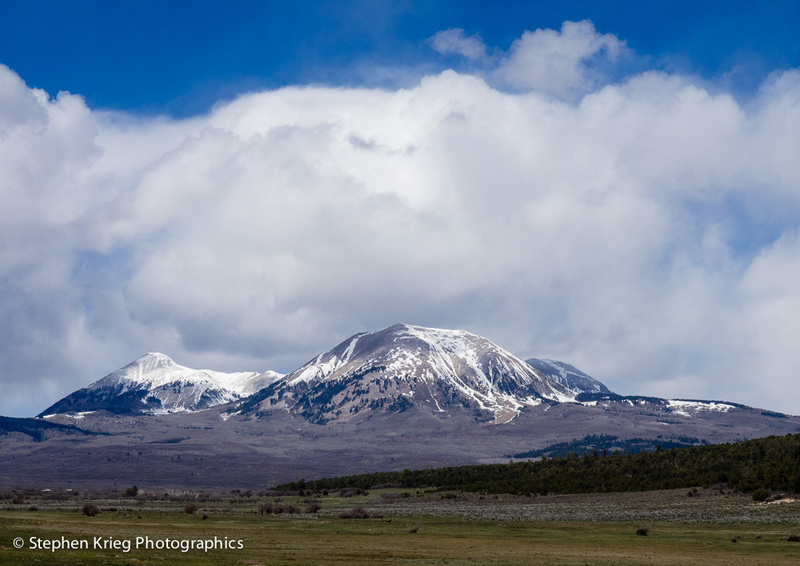 With Moss Back Butte and, 75 air miles to the southwest, the hulk of Navajo Mountain. Maverick Point and Cedar Mesa from Photographer’s Point. The descending sun made the Point glow warmly with its low rays as it approached a horizontal cloud bank, disappeared behind it, then re-emerged below. When it did I turned the camera off to protect a searing high intensity shot into its sensor and circuit. In case the Olympus engineers hadn’t programmed it to protect itself from that sort of thing. Sun, cloud bank, and the distant Henry Mountains. Finally, actual sun set time, slipping below the horizon. I was hoping that the cloud bank above would light up with rich reds and oranges as I’d seen it do so many times. But tonight it was merely moderate. Why? Another, barely noticeable, cloud bank way to the west at the very point of sunset. Sunset panorama from Cedar Mesa, Henry Mountains in far distance. Fine enough, though. Especially given the dramatic southeast Utah scenery, the clear, clean air, and the solitude. 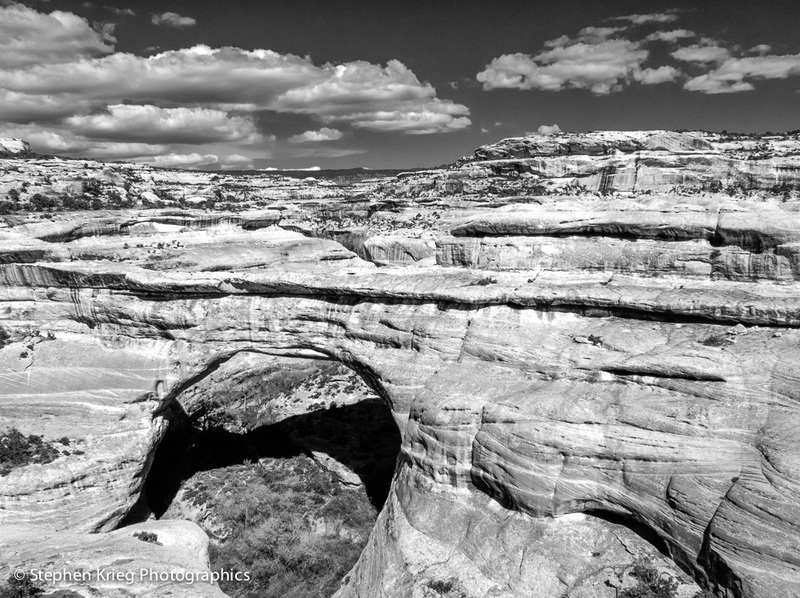 Photo Location: Cedar Mesa at Natural Bridges National Monument, San Juan County, Utah. 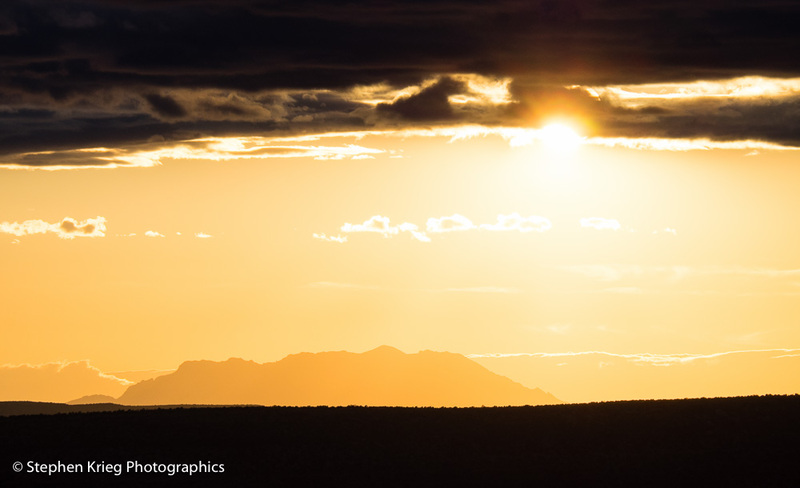 Springtime in the high desert of the Colorado Plateau region means sunny, dry weather. The time between the snows of winter and the rains of summer. And usually cloudless except for occasional high hazy clouds. Which I hate. So when there were some cumulus clouds at Natural Bridges National Monument lately, I was glad to include them into the compositions in my camera’s viewfinder. Halfway down the trail to Sipapu Bridge, sixth largest in the world and second largest in North America, is a very wide sandstone ledge that allows one to walk out comfortably and photograph the massive bridge in its entirety. And in its setting. Because the Cedar Mesa Sandstone layer is very thick, and very cross bedded, because this was a vast area of sand dunes millions of years ago. Rather like today’s Sahara Desert. I decided to convert this image to black and white. The puzzle of sandstone layers is complemented by the sky and clouds very nicely. And accented by the shadow of the bridge across its streambed at the bottom of White Canyon. 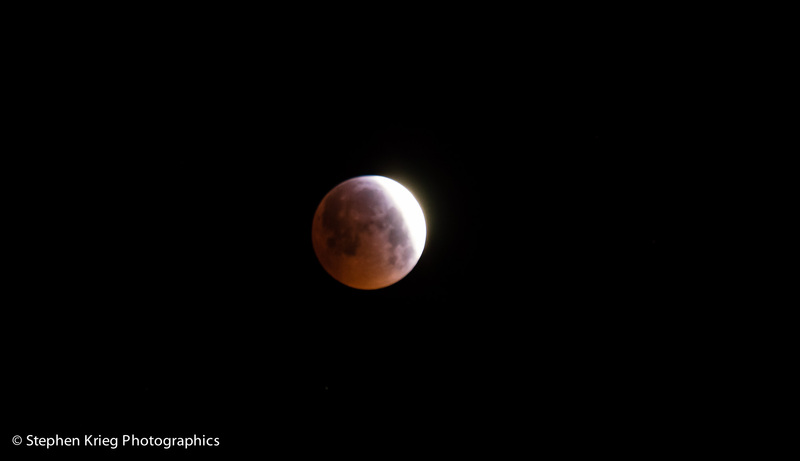 Lunar eclipse, slightly past Totality. Last week’s lunar eclipse was relatively easy to deal with in that it occurred so late in the night. Meaning it happened nearer to dawn than during the most wee hours of the night. Just get up extra early and stay up for sunrise shots, instead of collapsing back into bed. 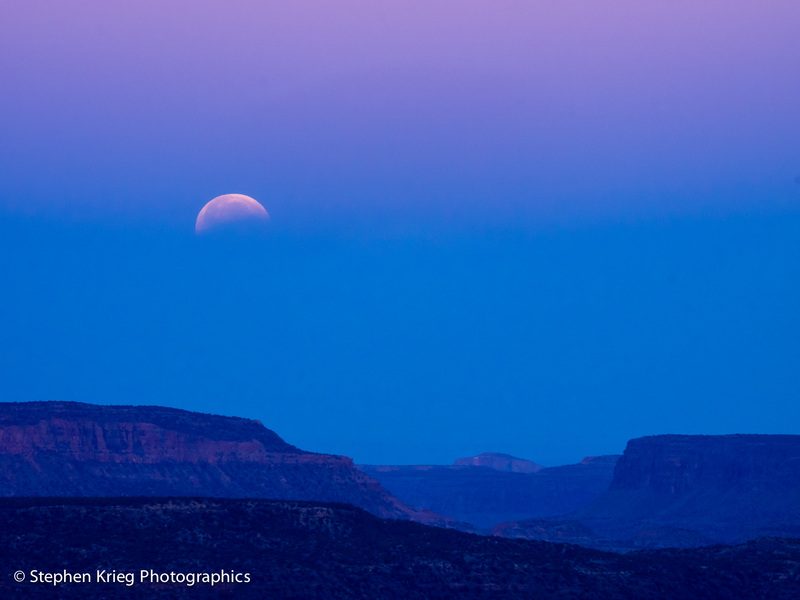 The full moon began passing into the Earth’s shadow about 4:15 a.m. Utah time. After peering out the window to conform I had the time right, I showered and ate an early breakfast. Then out to a favorite spot with a completely clear view of the western horizon. It was cold, but not really freezing. I kind of cheated by setting up the camera on tripod and taking some shots at intervals, retreating to the warm cab of my vehicle for more coffee. Call me a wimp if you want to, but let’s see your shots first. 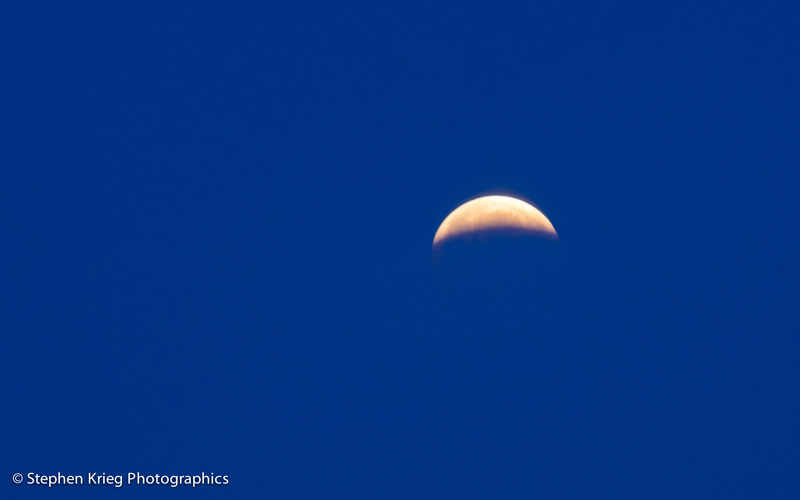 And it was my first lunar eclipse shoot, so I should get some extra slack there. I thoroughly enjoyed the experience, which is all that really matters anyway. The 300mm zoom shots were kind of soft. Need more experience there. But I was more interested in what the scenery would look like as first light appeared, then full dawn. 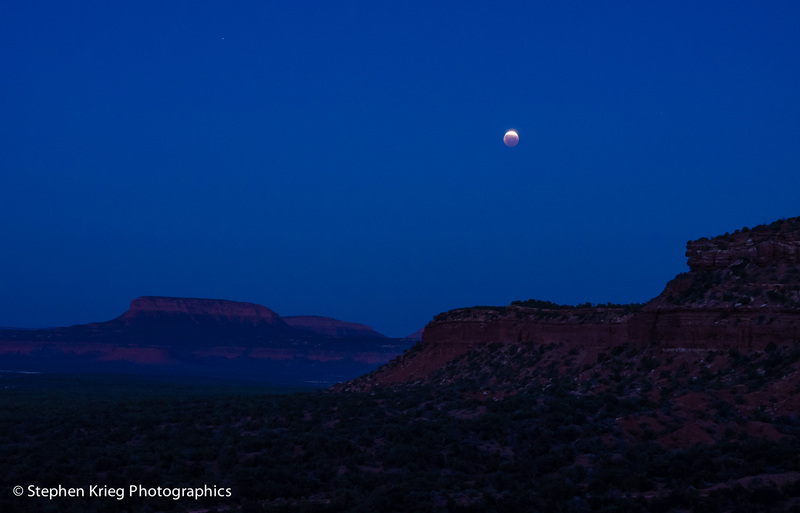 Lunar eclipse at first light, over Deer Flat and Moss Back Butte. I wasn’t disappointed. Not with a clear sky and high desert mesas in the distance. From black and deep blue silhouettes with the moon starting to come back out of eclipse, then to dawn light with the Earth’s deep blue shadow and the pink Venus Band above it. Top crescent of the moon past Totality, in the pre-dawn sky. The last two shots show the moon only partially in eclipse again, coming out of it, right on the edge of Earth’s shadow. The violet Venus Band showing above Earth’s shadow as the moon continues to set. 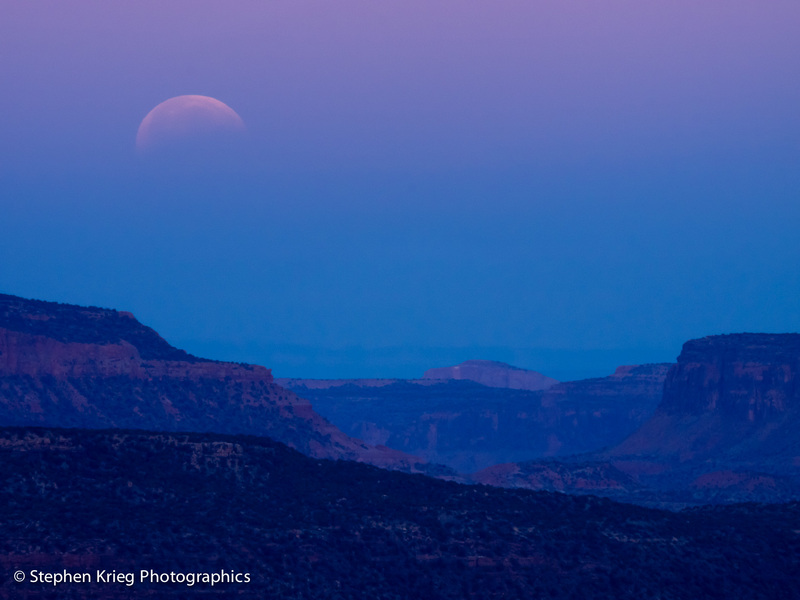 Finally, the moon faded gracefully from view into the haze on the western horizon as sunrise approached.